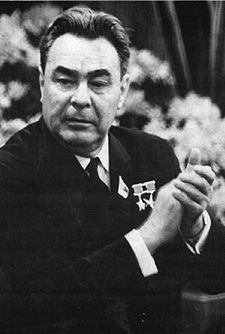 Former General Secretary of the Communist Party of the Soviet Union Leonid Brezhnev. They've tried nearly everything else to seal the disastrous oil leak in the Gulf of Mexico, so why not just nuke it? No, that's not an original idea. In fact, you can read that suggestion on the pages of one of Russia's leading daily newspapers, Komsomoloskaya Pravda, which claims that the Soviets deployed specially-designed nuclear explosions to extinguish well fires on at least five separate occasions. The idea was to harness the impact of the explosions that, among other things, would push tons of rocks into place and seal any leaks. The newspaper reports that authorities used a 30 ton atomic explosion triggered at an underground depth of six kilometers on Sept. 30, 1966, to extinguish burning gas wells in Urt-Bulak, an area about 80 kilometers from Bukhara. A second 'success' made Soviet scientists confident about "the use of this new technique for rapidly and effectively controlling ran away gas and oil wells," according to a U.S. Department of Energy report on the Soviet Union's peaceful uses of nuclear explosions. But not each use of nuclear energy did the trick. A 4 kiloton charge set off in Russia's Kharkov region failed to stop a gas blowout. "The explosion was mysteriously left on the surface, forming a mushroom cloud," the paper reported.